The What: InFocus Corporation is now shipping six new entry level projectors for use in boardrooms, classrooms, and on the go. The What Else: The IN110 Series is comprised of models to fit a wide range of common requirements. The IN112xa, IN114xa, and IN116xa are equipped with all the standard connectivity needed for the classroom or conference room, including dual HDMI, VGA, S-Video, and 3.5mm audio ports. The IN112xa, IN114xa, and IN116xa models deliver 3,500 lumens of brightness and an 18,000:1 contrast ratio for clear images regardless of the projection surface, including beige walls, whiteboards, or blackboards. The new projectors all include 15,000 hours of lamp life with dynamic mode, allowing the level of brightness to be adjusted for content, location, or scenario. To further extend the life of the battery, the IN110 series comes with the Eco Blanking feature to instantly dim the screen when the projector isn’t being used, and reduce the lamp’s power consumption to 30-percent. 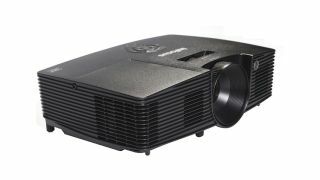 The IN110 Series supports multiple forms of 3D content, including Blu-Ray, 3D broadcasting, video games, and PC connectivity. Each model is compact and lightweight for portability and ease of installation.